I was going to post this as a follow-up in the 4.10 gear thread about re-calibrating the speedometer but it seemed like a bridge too far in terms of a thread jack so I thought I'd start a new thread. I suspect I'm going to cover ground that has already been covered in a few threads so I apologize but hopefully this helps someone. Also, if you don't want to waste your time with my nerd-ery throughout, just go to the last two paragraphs. Re-gearing for different tire sizes is a topic that I have followed for some time with keen interest. For one, I have a lifted truck with 35-inch tires (more on that later) still on the stock gears and am eagerly awaiting the moment I have enough cash to re-gear it. I hope to do so in the next couple months. Second, this topic is interesting to me because it seems to be loaded with opinions about the correct gear to choose, which is surprising since gear ratios and their effects are a known quantity. Full disclosure: I have never worked in the auto industry and I am NOT a certified auto technician. I do have a BS in Aerospace Engineering (I am NOT a practicing engineer) and a fair amount of technical experience so I consider myself at least partially qualified to discuss technical topics in general terms. As always, there are definitely people that frequent these forums that know more than I do. If you fit that description, please chime in and correct my errors. Pointing out that I'm wrong won't hurt my feelings. I will feel bad, however, if someone spends a bunch of money or makes a poor decision based on my bad information. Everyone has different desires for their truck's performance so I always cringe when I see a new thread with the topic "What gear ratio should choose?" The only thing that makes me cringe more is when someone posts in that same thread "You should get 4.56. That's what I did and I love it. You'll be happy." That's great but it's also totally useless feedback in my opinion. Without any explanation for the reasoning behind the decision and likely with no knowledge on what will make someone else happy that's a pretty big leap. I find myself frustrated when someone's emotions drive their recommendation for a specific gear ratio based on how they feel when they drive their own truck. I don't know anyone on this forum personally. I respect all of you for our common love for our own trucks but I will always be skeptical when a relative stranger gives me a recommendation based on their "feelings." 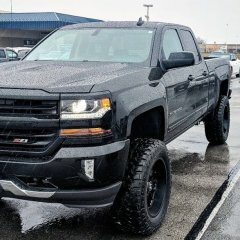 On to my specific example: my own 2017 Silverado 1500 LT Z71. I bought the truck from the dealer with a 6" lift, 20-inch wheels and 35-inch tires already installed. I love my truck. What I didn't do, largely due to a lack of experience and research was get new gears installed right away. I wish I had. I plan to do so soon so the natural question is "What gear ratio should I get?" I don't tow much. When I do, it isn't especially heavy. I bought a 1500 for that reason. 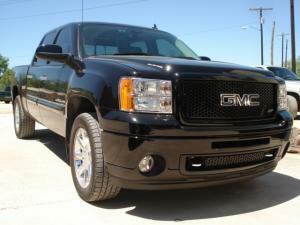 I love the bigger, stronger trucks but at this point in my life I just don't need one. So if you're like me and have 35-inch tires and the GM stock 3.42 differential gear (6-speed transmission), the determination on the new gear ratio now depends on what I want to do with the truck. In my case, I want to get back to stock performance/drive-ability, or as close as possible. To figure out how to do that, there is no opinion needed. It's a question of geometry and its associated math. If you Google the phrase "gear ratio tire size" you will be inundated with calculators that will tell you what you need. I picked the first two that popped up. One said my current effective gear ratio is 3.17 and I need to be a 3.98 to get back to stock. The other said my numbers were slightly different but not by much. The difference is likely because one calculator used a simple "tire diameter" figure and the other used actual tire sizes. With that info alone, I will round to the next lower ratio (numerically higher) and go with 4.10 gears. The common response to this line of reasoning that I see is "But, dude, what about the rolling mass of the new, bigger tires?!?" Great point. First off, I'm a nerd so what we should probably be referring to is "angular momentum" which is what is probably meant when people say "rolling mass." Every wheel/tire out there is rolling mass but it's the angular momentum of that wheel and tire that we're concerned about. Specifically accelerating when we're talking gears. First, a few relevant formulas: L=I*ω "L" is Angular Momentum "I" is moment of inertia "ω" is angular speed, aka how fast the thing is spinning I=r^2*m "r" is radius "m" is mass The second formula just states the obvious - a bigger/heavier wheel has a bigger moment of inertia than a smaller one. What might be less obvious is the impact each variable has. Moment of inertia increases linearly with an increase in mass but exponentially with an increase in radius. To make it relevant, if my 35s and your 37s, including wheels, are the same total weight you have a much bigger angular momentum problem to deal with than I do. You can see from this point already that accounting for angular momentum is difficult because it's based on speed. Turning your new big, heavy wheel/tire combo gets harder as you go faster so it's very difficult to account for that stress on your drive train since it changes as you accelerate. I would submit the bigger discussion here is the need for better brakes but that's a different topic. I haven't been able to find a good calculator to account for angular momentum differences with wheel/tire combos and haven't been willing to really dig down to generate an answer. Part of that is because of the speed variability. Another part is because I had had a surprisingly difficult time finding the actual weight of OEM wheels and tires. Finally, I'm not sure the difference in angular momentum makes a huge impact on the overall stress on the drive train. While The additional weight/radius of the tires is relevant, I don't know how much it matters when those wheels are still sitting under a truck that weighs over 5,000 lbs. This point is a bit speculative on my part and my instinct could be way off how in how much angular momentum affects the overall drive train forces. Real engineers, feel free to chime in here if I'm way off base. With all of that in mind, my conclusion is that changing gear ratios for new wheels and tires is hugely important because it allows you to match your differential ratio back to your transmission. The "system of systems" inside the truck were designed for a specific reason and matching your gear ratio to your new tires will get you back in that "sweet spot" the GM engineers found when they designed the truck. Using the online calculators to determine your new gear ratio based purely on the new radius or your tires is likely enough to answer the mail. Based on those calculators, I need to go to 4.10 to get back to stock. The guys that jump up and down saying 4.56 is the answer because they "like it" are potentially introducing new engineering problems in their truck by forcing all of the rotating internals to spin at a higher speed than originally intended for long periods of time. I'm not saying there aren't reasons to go to 4.56 but I would argue that gearing too low can be as risky as gearing too high if your goal is to have a safe, drive-able truck that lasts a long time. Again, I hope this is helpful and I welcome any feedback anyone has to make this info more useful. Hey guys. New here and wanted to ask you a question. Its cold here in midwest. This morning I went to start the truck and shift into drive, I was little rough on the shifter. Pulled the shifter too hard and it went crunch, and it fell still dangling on the rubber boot still in park. What am I up against here? I know the shifter is a solid steel that goes into column. Trying to tell if my new/used truck has been tuned by previous owner. Ok first I want to apologise if this thread has been done. I just started my account today. So I bought a 2016 Silverado 1500 LT Z71 4x4 with 37k miles a few days ago. It has a 5 or 6 in RC lift and 35x12.50r20 MasterCraft courser MXT tires on it. And the Hostile predator wheels. My question is, I don't know if the truck has been geared. Tuned. Or calibrated by the previous owner. The dealership doesn't know. The truck doesn't feel "sluggish" to me personally. I drive past the digital speed trap in my town and if I'm doing 30 on my guages the reader says 31-32... On the highway at 70mph my tach reads the notch under 2k.. so 1800?.. when cruising at 30-35 my tach reads around 1100-1200. I find I get in town with A LOT of stopping and going around 13mpg and that's driving very conscious. I notice it shifts around 2500 and then lower in the higher gears like 2000 then 1500.. but seems to chug along nicely around that 1200 mark. Also. My V4 mode has never turned on once. Not sure if that's due to the current cold northern Ohio climate right now. Or if the previous owner has a tune on it and disabled that feature. I just don't want to spend the money on a tune and calibration if I don't have to. When I floor it it gets up and goes fast imo. I don't floor it often at all. It doesn't pull or tow or haul much. I'm a maintenance engineer in a flat Ohio town of 50k ppl. So I don't think I'll regear because it won't be working too hard. If I could get some folks to shed some light on my curiosity I would greatly appreciate it. If all else fails. I'm buying a good tuner I guess... Thanks guys. Hi, never owned a truck before. I am keen to get one as I live in the country and would appreciate the flexibility of a pick up. I am not planning on towing anything except the odd light uhaul trailer. My priority is the best acceleration followed by fuel economy. I'd like to start off by thanking you all for stopping by to read this post and helping me out...!!! This summer I plan on throwing a 6 inch lift kit from BDS onto my 2008 Silverado 1500 Ext cab 4x4. Here is a link to the kit: http://bds-suspension.com/product?ma=5&mo=1&ty=1&yr=2007-2013- But before I throw it on, I'd like to know some options I have for locking difs. I plan on running 4.56s or even 4.10 (I still haven't made my mind up yet). I am currently running stock gears which are 3.73 on 33" tires. When I do the lift her, I'd like to run 35s (maybe on 17s or 18s).. haven't decided on that either; don't know which would look better with 35s). Now, my truck has the RPO code that states it has the Eaton G80 Locker. I picked her up in early to mid October of 2014, and since owning the truck I have yet to notice the locker engage. I've been through some deep snow, ice, gravel roads, and some light mud with terrible tires and even then haven't noticed an engagement..? At this point, I'm feeling like I may not actually have a locking dif . So, I start looking briefly at some locking diffs online (one of them was the Detroit Truetrac). But I read somewhere that they don't suggest tires over 33s; reason being that the tire is too big and the locking dif won't engage. Because of that, I'm lost on what locking difs are available/ones I should consider looking into. I don't plan on beating my truck into the ground, nor do I plan on doing extreme off roading/jumping my truck. More like nice casual off-roading with some buddies, going to our fishing/hunting grounds, and exploring new areas. As well as going mudding wherever & whenever we can Appreciate any help any of you can give me. Thanks! Hello Everyone, I hope you all are doing well. I have a 98 GMC Suburban 4x4 and my transmission has been acting funny. At first it went into Limp mode and would only run in second and third gears. I had the code pulled and it was the 3-2 solenoid. I replaced it today and topped the transmission off. After doing so i proceeded to test drive the vehicle. The trans slipped a little going into first but other than that did fine. It shifted between each gear smoothly. I headed home 20-30 minutes after the test drive. 20-25 minutes into the trip, on the interstate, The vehicle Downshifted and the rpms shot up. At first it down shifted and the Rpms went up to 3 and stopped then they went to 4 and it down shifted again. i pulled over and restarted it. I proceeded to try and accelerate again and was unable to get the burb past 30 mph without the RPMs jumping up and losing power. Does anyone have any ideas on what this might be? If you need any more information please let me know. Had the rear differential gears and bearings changed. All Okay if I drive straight. If I turn then the tires start to skip. Try to turn on the Traction Control and the display says stability control disabled. Mechanic says drive it like that for a while it will go away (not). Can anyone help?